On August 15, 1759, Hannah Waterman King Arnold died at the age of 51 due to a mysterious illness and some claim a broken heart. Mother and son supported each other during difficult times so with a heavy heart, Benedict organized her funeral arrangements and watched as his long-suffering mother was laid in her grave. Benedict was now responsible for his sickly father and his younger sister, Hannah, while still apprenticing with the Lathrop brothers. The epitaph on her grave, written by her son, shows that Hannah is remembered as being a woman of “piety, patience, and virtue.” Captain Arnold’s alcoholism worsened with his wife’s death and the once respected town leader was arrested for public intoxication and threatened with excommunication. After their father’s death in 1761, Hannah continued to live in the Arnold homestead while her brother traveled to New Haven on business for the Lathrops from 1762 to 1764. Hannah was “pleasing in person, witty and affable” and she began receiving the special attentions of a Frenchman. Benedict disapproved of the relationship so Hannah and the Frenchman met secretly while Benedict was away. According to Francis Caulkins, Benedict came home unexpectedly one night and saw the two lovers illuminated in the parlor. Benedict positioned himself in front of the house and instructed his companion to beat the door as if to break it down. The panicked Frenchman escaped out the window and Benedict aimed his gun and fired at the retreating figure. Benedict missed his mark because it was so dark, but needless to say, the Frenchman never called on the Arnold home again. Hannah never married and remained devoted to her brother, helping manage his family and business all her life. Later, Arnold and the Frenchman met again in the Bay of Honduras. The pair dueled and the Frenchman was wounded. In the cemetery are the remains of Hannah Waterman King Arnold, Captain Arnold, the infant son Benedict, Absalom, Mary and Elizabeth. Hannah Arnold is buried in Canada. 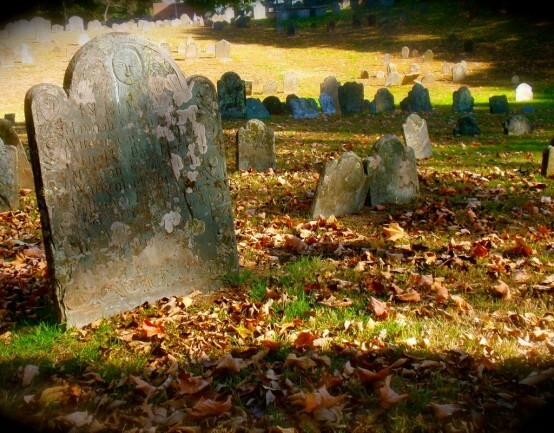 The markers of the two Benedicts were dislodged following the discovery of Benedict Arnold’s treason in 1780: allegedly, angry citizens descended on the cemetery and removed the graves named “Benedict Arnold.” The graves of Hannah, Absalom, Mary and Elizabeth still exist today. Gov. Samuel Huntington, Dr. Daniel Lathrop, Diah Manning and other prominent Norwich citizens are buried in the cemetery. Benedict Arnold is buried in St Mary’s Church, Battersea, in London with his wife Peggy and daughter Sophia.